I will begin with something that I know more than anyone else. On August 30th, 2005 I was announced to be a suspected in the assassination of the Prime Minister Rafik Al-Hariri during a press conference that brought together the Prime Minister Fouad Al-Sinior who was entrusted to apply theoretically the law in Lebanon, and the Chief of the International Commission of Inquiry Detlev Mehlis, the legal representative of the prosecution in the criminal investigation which Lebanon was supposed to learn and to practice. That announcement was a violation of the simplest rules of law, because the commission neither sought to meet me, nor called me and I evaded. The accusation of suspicion without any investigation and without any defense is a crime. As for raiding my house in an intelligent way although they know in advance that I was in Damascus and timing the raid in order to oblige me to stay in Damascus for fear within a scenario of false witnesses and domino stones and prosecuting Syria in charge of harboring the wanted is a disgraceful process against investigation and the claim of search for truth. Maybe, the approach of this issue stems from the question about how can the tribunal justify its credibility in parallel with its ignorance of the false witnesses, manipulation of dignities, and the distribution of accusations without ending this cause legally. Why does someone resort to manipulation of investigation and use false witnesses in order to support false accusations unless he has an interest in hiding the real criminals? And why did not the court ask the Public Presecution about the reason of this ignorance as one of the hypotheses and possibilities which it must review to choose the most realistic and coherent. The return to this point in the course of discussing the text of the public presecution could thwart that big conspiracy and frustrate the considerations, especially because I decided to return immediately to Beirut defying the Commission and its investigators and asking to show me the reason, justification, or document for what was announced by their chief and our prime minister, but the public presecution continued what has been done by its predecessors in the Investigation Commission, it did not stop at protecting them from the accountability, covering their abuses, and condoning the secrets of their dirty game which caused the unfair detention of four senior security and armed forces officers for several years. It is a game that is related to the assassination or at least its disclosure must lead to the plotter, planner and executor in the cause of the false witnesses as a way that could lead to the planner, plotter and the executor of the assassination itself. But the public presecution left no place for its fall despite its naïve, fragmented, and politicized report; it was involved in mentioning my name twice to ensure its information regarding the assassination, once written in its report when it claimed that the meeting that brought me with the Prime Minister Rafiq Al-Hariri on February 4th of 2005 ten days before the assassination was dedicated to notify me that Al-Hariri would not include me in his list in the parliamentary elections, and once orally, when it talked about the political reason for Al-Hariri ‘s being away from any understanding with Syria and its allies despite the presence of those who tried to affect Al-Hariri reversely. The simples comment on what I already told the International Commission of Inquiry on August 30thand September 8th 2005 after my return from Damascus was when the investigators said that they had a report from a reliable resource (He is the false witness Zuhair Al-Sedeek) He said that he saw at a Syrian security center in Damascus a report that belongs to Baath Party, and it was likely to be signed personally by me, and that report calls for getting rid of Al-Hariri. I commented that their information is like the information of the one who pretends to be a religious man, and his claim of knowing about Imam Hassan and Hussein that “ Al Khasan and Al Khussein are Muawiya’s daughters that were born in Istanbul” asking them to write that down as a response to their questioning. Therefore the report of the presecution is like the recognition of that claimer about Imam Hassan and Hussein. It is useful to say that I was happy upon mentioning the meeting with the Prime Minister Al-Hariri on February 4th 2005 despite my demand from the International Commission of Inquiry to investigate in the facts of that meeting which was under the demand of Al-Hariri through the deputy Dr.Atef Majdalani and with the presence of the Major General Wissam Al-Hassan who was still alive when I was brought before the court, they knew at least that the Prime Minister Al-Hariri wanted to reconcile with me after I blamed him upon mentioning my name among those who called them Deputies to Syria, although he knew that my nomination was under an accordance between him and the Speaker of the Parliament Nabih Berri in exchange for nominating his sister the Deputy Bahiya Al-Hariri in the list of the Speaker Berri in the south. I had already told my colleagues Faisal Salman and Mohammed Shuqair whom I asked to send my message to Al-Hariri that I would not visit him unless he apologized for this abuse. Dr. Majdalani knew who was the initiator for that meeting and in which context, because I gave him a kind of text from my lecture in Tripoli to the Prime Minister Al-Hariri, talking in it that” on the basis of the good behavior of the Shiites of Iraq and the Sunnis of Lebanon, the fate of the resistance and the region will depend, because the US project wants to tempt them with positions in the rule to undermine the resistance”. I received a call from the Prime Minister Al-Hariri telling me that I read your response and that will not happen, asking for a meeting to explain my blame. He added that he did not mean me when he talked about the deputies to Syria, and he has every respect and appreciation. So our meeting was on the next day. In the meeting, I told the International Commission of Inquiry about many facts, I asked for the presence of the Major General Wissam Al Hassan to ask him about the part in which he was present, during which Al-Hariri asked him to tell me about his meeting with the Deputy Faris Said in 2000. Al Hassan told me about the disagreement between the Prime Minister Al-Hariri and The QornetShehwan Gathering “The Christian title of the opposition of Syria and its role at that time” It is the opposition which the public presecution wanted to convince us that Al- Hariri desired to lead an electoral alliance against Syria, considering that it was a political context for the assassination”. Al Hassan said “We were near the door of the elevator, Al –Hariri asked Said “how can ten years lead to hostility against Syria” He replied “The hostility’s age is one thousand and four hundred years”. Al-Hariri commented “Today, those who are standing against Syria and calling us to ally with them, hate the history of 1400, it is the date of Muslims not the history of a certain regime in Syria, so Al Hariri will not cooperate with them” This was documented in the investigations of the International Commission of Inquiry, but it was intended to be ignored. This affirms at least two facts: first, the Prime Minister Al-Hariri was interested in dispersing any impression about his intention to lead an alliance against Syria, which the pubic presecution claimed that it was the decision of the Prime Minister. Second, the meeting was cordial and political not electoral at all, by the way that was my condition for the meeting. Once again, my demand was ignored deliberately when I asked the International Commission of Inquiry to listen to the recordings which were in the house of the Prime Minister Al-Hariri and to listen to that meeting which focused on the desire of the Prime Minister Al-Hariri to know about my objection of an electoral law on the basis of the judiciary as an electoral district on one hand, although he knew that this law got the support of the President Bashar Al-Assad and I am so close to Syria on the other hand. My answer was simply because the project of Judiciary is not the project of the President Al-Assad who was standing neutral between his allies; the President Emile Lahoud and the Minister Suleiman Franjieh who were with the judiciary, while the President of the parliament Nabih Berri and Al Sayyed Hassan Nasrallah who were against the judiciary. Al Hariri inquired about the opportunity to restore the relationship with Syria, readopting the formula of Syria’s allies, and the understanding on a unified draft of an electoral law, I replied positively and we agreed on formulas of communication and positions that met the satisfaction of Syria and its allies, most importantly was his public words against the resolution 1559 by saying the Taif Agreement is unifying us while 1559 resolution is dividing us”.. The simple question is how did the public presecution know that Al-Hariri wanted to notify me that he would not put my name in his lists? Was he obliged to hold a meeting for such a purpose? He said that publicly a month ago, did it require two hours for notification? Was the meeting under my request to be in his list and then he told me his refusal? Or was it under his demand and my condition was not to discuss the electoral issue in order to keep our friendship and our political search? Why his meeting was followed by his words about the resolution 1559 and Taif? Why did he summon Wissam Al Hassan to notify me about his view of Qornet Shehwan Gathering? And many things that were discussed at that meeting that interpret the political context of that assassination in order not to mention any cooperation between Al-Hariri and Syria, Hezbollah, and the allies. In the report of the head of the fact-finding mission Peter Fitzgerald there are two political hypotheses; one says that the assassination occurred to prevent the formation of an opposition to Syria and retaliation from the supposed role of Al-Hariri in the resolution 1559. The other hypothesis says that the assassination aims at prosecuting Syria and the resistance and turning his assassination into a roadmap to apply the resolution 1559, so how could a fair court accept that the public presecution could adopt one of the hypotheses without making any effort for a detailed search? The fragility and the political manipulation do not need evidences in the text of the presecution which based on elements that are legally described as valueless for accusation, versus contexts and hypotheses that start from the political context and end with false witnesses. The Israeli communication network jamming was kept unknown in the report of the commission, and the one who bought the Mitsubishi car was kept unknown too, as the fate of Ahmad Abou Adas and the suicide bomber, even the proving of the possession of many telephone lines to the presecution contrary to the testimonies of the witnesses. Nothing is known for granted and without investigation or court except the fact that the Hezbollah’s leaders killed Al-Hariri !!!. If the tribunal wants to save the reputation of the international judiciary, it has to refuse the statement of claim at least, because there are not evidences at all not due to their inadequacy. – سأبدأ في شأن أعرفه أكثر من أي أحد آخر، وهو أنني أُعلنت في 30 آب 2005 مشتبهاً به في جريمة اغتيال الرئيس رفيق الحريري، عبر مؤتمر صحافي احتفالي لكل من رئيس الحكومة فؤاد السنيورة المؤتمن نظرياً على تطبيق القانون في لبنان، ورئيس لجنة التحقيق الدولية ديتليف ميليس ممثل التطبيق الدولي لقواعد قانونية في التحقيق الجنائي، يفترض أن لبنان يحتاج إلى تعلمها والتدرّب عليها، فيما الإعلان مخالفة لأبسط قواعد القانون في جمهوريات الموز، لأن اللجنة لم تسعَ للقائي من قبل، ولا وجهت لي أي دعوة وتهرّبت منها، وإعلان الشخص مشتبهاً به دون تحقيق، ودون دفاع جريمة موصوفة، أما مداهمة منزلي بصورة استخبارية لمن كانوا يعلمون سلفاً وجودي في دمشق، ووقتوا المداهمة والإعلان على ساعة موضوعها دفعي للبقاء في دمشق، ضمن سيناريو شهود الزور وحجارة الدومينو، كي أبقى هناك خوفاً، وتتم ملاحقة سورية بتهمة إيواء مطلوبين للعدالة، فهي عملية مشينة بحق التحقيق وادعاء البحث عن الحقيقة، وربما كانت مقاربة الموضوع اليوم جانبية من باب التساؤل عن كيفية تبرير المحكمة لصدقيتها بالتوازي مع تجاهلها للعبة شهود الزور والتلاعب بالكرامات وتوزيع الاتهامات، من دون إنهاء قانوني لهذا الملف ووضعه تحت الضوء من زاوية التساؤل: لماذا قد يلجأ أي كان للتلاعب بالتحقيق ويوظف شهود زور لدعم اتهامات لا أساس لها ما لم يكن صاحب مصلحة في تغطية المجرم الحقيقي، ليبدأ الادعاء العام تحقيقه من هذه القرينة، التي تجاهلها كلياً، ولم تسائله هيئة المحكمة عن سبب التجاهل، من ضمن الفرضيات والاحتمالات التي يفترض أن يستعرضها، ويفككها ليرجح منها الأقوى والأشد تماسكاً. «إن الذين يقفون بوجه سورية اليوم ويدعوننا للتحالف معهم حاقدون على تاريخ 1400 عام هو تاريخ المسلمين وليس تاريخ نظام معين في سورية، وليس رفيق الحريري من يضع يده بأيديهم». وهذا مدوّن في تحقيقات لجنة التحقيق الدولية لكن المطلوب تجاهله، وهو يؤكد حقيقتين على الأقل، الأولى أن الرئيس الحريري كان مهتماً بتبديد أي انطباع حول نيته قيادة التحالف بوجه سورية، الذي يزعم الادعاء العام أنه كان قرار الرئيس الحريري، والثانية أن اللقاء كان ودياً وسياسياً وليس انتخابياً على الإطلاق، وبالمناسبة كان هذا شرطي المسبق للقاء. «الطائف يوحّدنا والـ 1559 يقسمنا». ‫علاقة الحريري ــ حزب الله «أفضل من أي وقت مضى»! – يكاد لبنان يشبه مطار الرئيس رفيق الحريري في كل شيء، حيث الحرارة مرتفعة بسبب تعطل كل عمليات التبريد، والازدحام في المشكلات يفوق الطاقة على الاستيعاب، والأعطال في آلات تنظيم الحقائب تتسبب بالضياع، والصراخ والضجيج في كل ناحية، وتكرار الاعتراف بوجود مشكلة، لكن في النهاية كل شيء يراوح مكانه، ما عدا حقيقة واحدة، أن الأمن العام يقوم بمهامه وكأن لا أزمات من حوله، ساعياً لتعويض ما أمكن من الصورة السلبية، وكما في المطار القضية أكبر من حجم دور وزارة الأشغال، قضية لبنان أكبر من تشكيل حكومة. – في لبنان إجماع على أن الحكومة نقطة البداية في مواجهة المشكلات وليس حلها، والحكومة تستدعي قراراً يجب أن يقوم على قراءة الوضع السياسي الداخلي وخلفياته الإقليمية، وفي الداخل رغم كل التسخيف المحلي للعقد الوزارية تبقى تعبيراً عن تجاذب يطال الخيارات التي تنتظر لبنان، من قضية العلاقة بسورية وتحت عنوانها المعابر والنازحين وبعض ملف الكهرباء، إلى قضية التوطين التي يفرض حضورها السعي الأميركي الحثيث بتنفيذ مضامين صفقة القرن بالمفرق والتقسيط، وحول المحورين الإقليميين والدوليين المتقابلين في هذه العناوين ينقسم اللبنانيون بين فريق يمثله رئيس الجمهورية وفريق يمثله الرئيس المكلف بتشكيل الحكومة، مهما حاول مَن يسعى لتدوير الزوايا، حيث الرئيس المكلّف يريد له ولفريقه الثلث المعطل وزيادة التعطيل الميثاقي في طائفتين من دون أوزان نيابية تبرر هذه الطلبات، ويرتهن الإفراج عن الحكومة بنية الحصول عليها تحت تسميات مختلفة من نزاع مفتعل حول الصلاحيات، إلى الاستنفار الطائفي حول الصلاحيات، وصولا لابتكار تسميات مثل التوازن الوطني بدل نسبية التمثيل النيابي في الحكومة، بينما يسعى رئيس الجمهورية المرتاح لنتائج الانتخابات النيابية لمنع محاولات تعطيل نقل هذه النتائج إلى التشكيلة الحكومية. – في المنطقة تحت سقف المواجهات الكبرى الدائرة حول عناوين متعددة، حراك متسارع سياسي وعسكري وأمني، ويدفع فواتير الخسائر مَن يتأخر في قراءة المؤشرات. فقد أحسن العراقيون القراءة عندما قرروا الإفراج عن عمليتهم الدستورية من وراء ظهر السعودية، واضطرت واشنطن للتعامل مع النتيجة، بينما لا تزال الرياض تتساءل كيف انتقل المحور الذي قامت بتشكيله لفرض حضورها تحت عنوان مذهبي ليصير عضواً في ائتلاف يقوده حلفاء إيران. والجواب واضح أن أركان هذا المحور حصلوا على رئاسة مجلس النواب، وهو ما لم يكن ليحصل لو لم يقرأوا الوقائع، وفي اليمن يقرأ المبعوث الأممي مارتن غريفيت وقائع الميدان وليس البيانات العسكرية الصادرة عن الرياض، وينتبه إلى فشل العملية العسكرية السعودية الأخيرة وصمود الحديدة ومحيطها، فينفتح على أنصار الله تحضيراً لجولة محادثات مقبلة، وفي صفقة القرن فشل ذريع في تصنيع الشريك الفلسطيني الذي بدونه يبقى ما يعده مطبخ الرئيس الأميركي وولي العهد السعودي ورئيس حكومة الاحتلال طبخة بحص، والمقاومة إلى تصاعد، والعزلة الدولية تصيب المشاريع الأميركية. وفي العقوبات على إيران يكفي كلام وزير الخارجية الأميركية مايك بومبيو عن إعفاءات ستضطر إدارته لإصدارها لحساب دول لن تلتزم بالعقوبات ولا تريد واشنطن إغضابها أو التصادم معها، كما كلامه عن بيع إيران نفطها للصين كحقيقة لا مجال لتغييرها، أما تركيا التي راهن الكثيرون على تصادمها مع روسيا من بوابة إدلب فها هي تعود إلى بيت الطاعة الروسي من بوابة قمة رئاسية عنوانها تجزئة العملية العسكرية إلى مراحل لكن بالأهداف ذاتها، وبشرط الشراكة التركية فيها، أما المحكمة الدولية فاللبنانيون أعلم بأنها عجزت عن جذب الرأي العام في لبنان وخارجه بجديد يمنحها مصداقية لا بد منها لضمان توظيفها سياسياً. وتبقى التهديدات الأميركية والاعتداءات الإسرائيلية مجرد يوميات الحرب التي اعتاد السوريون التعامل معها مع بداية كل جولة حسم ليردوا عليها بالجملة مع نهايتها، بعدما تتكفل صواريخ الدفاع الجوي بتعطيلها مع كل محاولة جديدة. – الرئيس المكلف بتشكيل الحكومة الذي يعرف أنه مرتبك بسبب حجم الدعم السعودي المتجدّد لحليفيه في حزب القوات والحزب التقدمي الاشتراكي، يعلم أن موقفه عشية الاحتجاز الذي طال حريته قبل عام كان هو الأصح، وهو ما أكسبه مكانة لبنانية لترشيحه لرئاسة الحكومة رغم وجود الأغلبية النيابية في غير صالحه. وهذا الموقف هو الذي وفر له تغطية إقليمية ودولية بعد تحريره لمواصلة لغة التسوية والمصالحة، ويجب أن يعلم أن ارتداده إلى الخطاب الذي تم فرضه عليه يوم الاحتجاز، والسلوك الذي أراده أصحاب الاحتجاز، سوف يمنحه ويمنحهم تأخير الحكومة، لكنه في النهاية سيفقده الخصوصية اللبنانية التي تشكل مصدر قوته، وعندها سيكون آخر من يعترف بالمعادلات الجديدة، لكنه لن يجد من يقف معه من الذين يزيّنون له اليوم لغة الارتداد على خطابه وسلوكه اللذين رتبا احتجازه ببركة زوار الرياض من اللبنانيين. – بالرغم من الكلام الكثير عن حجم الرهان على الحزمة الثانية من العقوبات الأميركية على إيران وما يتصل بصادراتها النفطية، أو الرهان على المحكمة الدولية الخاصة بلبنان، أو الرهان على تحوّلات بنتيجتهما في حرب اليمن، أو الحسابات لتغييرات ينتجها الضغط الأميركي على الكتل النيابية في العراق، أو ما يروّجه البعض عن حسابات تنطلق من نتائج القرارات الأميركية التي تستهدف القضية الفلسطينية، فإن التدقيق بكل هذه المفردات يكشف أنها مجرد حروب نفسية يعرف أصحابها أن فعلها قبل وضعها قيد التنفيذ هو المأمول وليس ما سينتج عنها في الواقع، وكلها مسقوفة بالعجز عن إحداث تغييرات في التوازنات أو تبديل في الخيارات. – وحدَها معركة إدلب تبدو استحقاقاً واقعياً للاستثمار على الإيحاء بما سيأتي لقطف ثماره قبل حلول مواسمه. فالمواقف الأميركية التي رست على دعوة علنية لمنع معركة إدلب بلسان ممثلة واشنطن في مجلس الأمن الدولي، وتلاقت مع مواقف أوروبية وتركية، هي العنوان السياسي الذي يجري توظيف الانتظارات في لبنان والعراق والضغوط على الفلسطينيين واليمنيين، وحسابات المحكمة الافتراضية والعقوبات المتوقعة، لجعل النتيجة المرجوة هي إضعاف الإصرار لدى قوى ودول محور المقاومة على خوض معركة إدلب، وفرض التراجع على روسيا، عبر التلويح لتركيا بفرصة للعب دور في الجغرافيا السورية يحظى بتغطية أممية إذا قبلت روسيا، تحت عنوان مواجهة الإرهاب وحماية المدنيين في إدلب. وما يعنيه ذلك عشية قمة طهران لرؤساء روسيا وإيران وتركيا، من سعي لتخريب القمة كإطار مأمول لتوفير الغطاء للمعركة، كما قال وزير الخارجية السورية قبل أيام. – يعرف الأميركيون والإسرائيليون ومعهم حلفاؤهم بلا استثناء محدودية القدرة على تغيير وقائع الميدان السوري عبر رسائل القوة التي يتحدّثون عنها، كما يعرفون أن إثارتهم للبعد الإنساني في إدلب، له وظيفة واحدة هي وقف المعركة، وليس ضمان بديل للمعركة العسكرية ينهي الوجود الإرهابي من دون قتال أو بخسائر محدودة. ويعرفون بالتالي أنهم يدعون للتعايش مع دويلة يسيطر عليها الإرهاب في شمال غرب سورية، تشكل عملياً تكريساً لتقسيم سورية. وتبرر بالتالي الدويلة التي يقيمها الأميركيون عبر احتلالهم مناطق شرق الفرات بعنوان كردي، وما يقترحونه على الأتراك عملياً هو دافعوا عن بقاء دويلة جبهة النصرة ودويلة كردية معاً، ليبق احتلالكم واحتلالنا معاً. – لن يتوقف الضغط الأميركي ومعه جوقة المنتظرين عندما تبدأ معركة إدلب خلال ساعات مقبلة، عن مسعاهم وسيبذلون الجهد السياسي والعسكري والدبلوماسي لمواكبة المعركة بالرسائل التي تتيح إبقاء خيار تعطيل مواصلة المعركة على الطاولة، وتبقى معه معادلة العصا والجزرة للأتراك حاضرة، ولذلك فمعركة إدلب هي بالوقت ذاته أهم معارك استعادة وحدة سورية، وأهم معارك الحسم مع الإرهاب، لكنها أيضاً معركة حسم موقع تركيا في الجغرافيا السياسية الجديدة في المنطقة. فبعد إنهاء دويلة إدلب سيكون قد انتهى الهامش الذي يحمي دويلة كردية شرق الفرات، وسيكون الأمن القومي التركي مصوناً بقوة حضور الدولة السورية في كل أراضيها، لكن سيكون على الاحتلال التركي أن يخرج من سورية، كما سيكون على الاحتلال الأميركي فعل الشيء نفسه، ليكون الخيار الوحيد على الطاولة حل سياسي ينتج حكومة ودستوراً جديداً فانتخابات. – قمة طهران محطة مفصلية في حياة أردوغان، خصوصاً مع الصيغ المرحلية المطروحة لمعركة إدلب بصورة تتيح عمليات جراحية متتابعة، والهوامش التركية باتت ضيّقة وهامش الزمن بات أضيق. As the War of July 2006 symbolizes the open confrontation between the resistance as a project of liberation and the occupation entity as a project of aggression, every subsequent round of this confrontation can be described as the new aspect of the War of July. This can be applied also on the rounds of the Lebanese internal exhaustion of the resistance between the War of July 2006 and the Doha Settlement in 2008 which ended the presidential vacancy and the abnormal governmental situation, after the last quarter of the internal decision of the government of the Prime Minister Fouad Al Siniora about uprooting the communications network of the resistance, and which was ended on the seventh of May 2008, when the resistance was obliged for the first time to deal with the internal differences not from its additive value, rather from its surplus power in the field even for few hours. In his pre-last speech the Secretary-General of Hezbollah Al Sayyed Hassan Nasrallah described the war launched on Syria for eight years as the Great War of July, after everything became very clear, and after it was clear the presence of the project of the alliance of the American-Israeli-Saudi War of July, that aims at achieving the same goals of the War of July but in new geography, trying to benefit from the lessons of the War of July, most importantly to be away from the direct confrontation, to tamper with the internal structure, to ignite the sectarian strife, to spread chaos, and to make use of the takfiri terrorism as a reserve army, so this enables administrating the war without the involvement of waging it directly, and provides the negotiating opportunities to impose the conditions of this axis on the forces of the resistance as an only way to stop this destructive war on Syria and the region countries. The resistance axis succeeded in embracing the Great War of July in its internal Syrian dimension due to the strength and solidity of the Syrian state, the political, cultural, and historical dimensions of the collective conscience of the Syrian people in their different segments, and the solid ideological composition of the Syrian Arab Army and the impossibility of dismantling it, according to the red lines of sects and doctrines. Moreover the axis of the resistance succeeded due to the surplus power of Iran and Hezbollah to achieve the needed military balance against the surplus of power of the external intelligence military forces along with hundreds of thousands of the fighters of Al-Qaeda Organization and its branches, so the required deterrence balance for overthrowing Syria has been achieved. Later, the axis of the resistance succeeded due to the strategic decision taken by Russia and the Syrian state to purge Syria of the foreign presence and the terrorist groups through adopting the opposite attack to restore the unity and the sovereignty of Syria over its entire geography without giving any concessions at the expense of Syria’s constants and its geostrategic identity. Therefore the project of dividing Syria and the sharing of its parts as security belts for Israel and Turkey has fallen. The Great War of July has become in its last quarter after the failure of every negotiation for a settlement that achieves some of the goals of the war, as the last moments of negotiation which accompanied the last days of the War of July 2006. It seemed that the events of the last year have been planned to meet this last quarter by the leadership of the war axis to undermine the additive value of the victory axis in Syria represented by Hezbollah. The US withdrawal from the nuclear understanding and the return to the severe sanctions on Iran became a project to weaken the sources of strength of Hezbollah, after the Americans conceded the impossibility of Iran’s siege of reducing the ceiling of its positions or to spread the chaos in it. Furthermore, the supportive American procedures to Israel regarding the fate of Jerusalem or the talking about the deal of the century seem without any goal except, igniting the hostile force of Israel in order to weaken Hezbollah for a decisive confrontation if its circumstances were provided, thus Yemen, Iraq, and Palestine become arenas for waiting till the Lebanese scene becomes clear, where the detention of the Prime Minister Saad Al-Hariri in Riyadh to tame him and to make him ready for the next round is just a round of the last quarter of war. Between Idlib and the east of Euphrates, the military and the political hours of resolving are passing very quickly, where America is seeking to disrupt them in order to pave the way for the round which must preceded it, where Lebanon is its arena. Therefore, the obstruction of the birth of a government with unattainable demands will not be mere an exaggeration of internal sizes, rather a needed waiting for the resolution of the international tribunal which the preparation for it have become an entry for the criminalization of Hezbollah and the call to exclude it from the government. The plan would not be complete in Washington, Tel Aviv, and Riyadh without the cooperation of those in Lebanon. Therefore, the governmental process has become related to the concept of the national security of the axis of the resistance, while the international tribunal has become a direct tool of war. This is the meaning of the words of Al Sayyed Nasrallah “Do not play with fire” “This is not negotiable. Period” because this playing in the last quarter of the last round of the Great War of July is recalling what happened in 2008 in the last quarter of the small War of July and will ignite a regional fire as the seventh of May, where the tribunal and the government will fall as long as the wisdom has fallen before… This the meaning of the warning of Al Sayyed of playing with fire ‘to return to wisdom, before some Lebanese will turn into just fuel for an Israeli war which is not desired by the resistance but it does not fear it, because it is aware that it will change the face of the whole region in the twenty-first century if it occurs. – بمقدار ما ترمز حرب تموز 2006 إلى المواجهة المفتوحة بين المقاومة كمشروع للتحرير وكيان الاحتلال كمشروع للعدوان، يمكن وصف كل جولة لاحقة من هذه المواجهة بالفصل الجديد من حرب تموز. وهكذا كانت جولات الاستنزاف الداخلي اللبنانية للمقاومة بين حرب تموز 2006 وتسوية الدوحة عام 2008 التي أنهت الفراغ الرئاسي والوضع الحكومي الشاذ، بعد ربع أخير في الساعة الداخلية آنذاك تمثل بقرار حكومة الرئيس فؤاد السنيورة باقتلاع شبكة الاتصالات الخاصة بالمقاومة، أنهته عملية قيصرية في السابع من أيار 2008 شكلت المرة الأولى لاضطرار المقاومة للانتقال من معاملة الخلافات الداخلية بقيمتها المضافة إلى استحضار فائض قوتها في الميدان، ولو لساعات قليلة. – وصف الأمين العام لحزب الله السيد حسن نصرالله في خطابه ما قبل الأخير، الحرب التي شنت على سورية لثمان سنوات بحرب تموز الكبرى، باعتبارها بعدما صار كل شيء فيها شديد الوضوح، قد تكشفت عن مشروع حلف حرب تموز الأميركي الإسرائيلي السعودي لتحقيق أهداف حرب تموز ذاتها في جغرافيا جديدة، محاولين الإفادة من دروس حرب تموز، وأولها الابتعاد عن المواجهة المباشرة والخاطفة، والذهاب للعبث بالنسيج الداخلي واللعب على الفتن الطائفية والمذهبية، وتعميم الفوضى واستثمار الإرهاب التكفيري كجيش رديف، ما يتيح إدارة الحرب لسنوات دون التورط في خوضها مباشرة، ويوفر الفرص التفاوضية لفرض شروط هذا المحور على قوى المقاومة كطريق وحيد لوقف هذه الحرب المدمرة لسورية ودول المنطقة. – نجح محور المقاومة باحتواء حرب تموز الكبرى ببعدها الداخلي السوري بفضل قوة ومتانة ورسوخ مشروع الدولة السورية، والأبعاد السياسية والثقافية والتاريخية للوجدان الجمعي للشعب السوري بشرائحه المختلفة، والتركيب العقائدي الصلب للجيش العربي السوري واستحالة تفكيكه وفقاً لخطوط التماس المرسومة للطوائف والمذاهب. كما نجح محور المقاومة بفضل فائض القوة الذي زجّت به إيران وحزب الله بتحقيق التوازن العسكري المطلوب بوجه فائض القوة الخارجي العسكري والمخابراتي، ومعه مئات آلاف مقاتلي تنظيم القاعدة ومتفرعاته، فتحقق ميزان الردع اللازم لمشروع إسقاط سورية، وفي مرحلة لاحقة نجح محور المقاومة بفضل القرار الاستراتيجي الذي اتخذته روسيا وإيران والدولة السورية بتطهير سورية من الوجود الأجنبي والمجموعات الإرهابية، بإطلاق الهجوم المعاكس لاستعادة وحدة وسيادة سورية على كامل جغرافيتها، دون تقديم أي تنازلات على حساب ثوابت سورية وهويتها الجيوستراتيجية. فسقط مشروع تقسيم سورية أو تقاسم أطرافها كأحزمة أمنية لـ«إسرائيل» وتركيا، وصارت حرب تموز الكبرى في الربع الأخير من ساعة النهاية، بعدما فشل كل تفاوض لتسوية تحقق بعض أهداف مشروع الحرب، أسوة بلحظات التفاوض الأخيرة التي رافقت آخر أيام حرب تموز 2006. – تبدو أحداث السنة الماضية وكأنها قد صممت لملاقاة هذا الربع الأخير من الساعة، من قبل قيادة محور الحرب للنيل من رأس الحربة والقيمة المضافة لمحور النصر في سورية، الذي يمثله حزب الله، فيكاد يختصر الانسحاب الأميركي من التفاهم النووي والعودة للعقوبات المشددة على إيران ليصير مشروعاً لتجفيف مصادر قوة حزب الله، بعدما سلّم الأميركيون باستحالة أن يؤدي حصار إيران لخفض سقف مواقفها أو لإطلاق مسار الفوضى فيها. وتكاد الخطوات الأميركية الداعمة لـ«إسرائيل» في مصير القدس أو الحديث عن صفقة القرن، أن تبدو بلا قضية سوى تحفيز القوة العدوانية لإسرائيل تمهيداً لملاقاة شروط إضعاف حزب الله بالجهوزية لجولة مواجهة حاسمة إذا توافرت ظروفها. وهنا لا يعود اليمن ولا العراق ولا فلسطين إلا ساحات انتظار، حتى تتبلور صورة المشهد اللبناني، حيث يظهر معنى احتجاز رئيس الحكومة سعد الحريري في الرياض لترويضه وتهيئته للجولة المقبلة، جولة الربع الأخير من ساعة الحرب. هذا مغزى تحذير السيد من اللعب بالنار، العودة للحكمة، قبل أن يتحول البعض من اللبنانيين إلى مجرد وقود لحرب إسرائيلية، لا تريدها المقاومة لكنها لا تخشاها، لأنها تدرك أنها ستغير وجه المنطقة وتأخذ معها الكثير من أوثان وأصنام المنطقة في القرن الحادي والعشرين عندما تقع. نصر الله: لا تلعبوا بالنار! مناورات إسرائيلية تُحاكي هجوماً على قرى لبنانية.. و”حزب الله” جاهز! “The Israeli army has developed much of its capabilities and acquired state-of-the-art missiles and military hardware, it cannot yet evade defeat,” Sayyed Nasrallah said in a speech marking the first anniversary of the Second Liberation of the Syrian border from the ISIL and Al-Nusra front control. “Foreign media outlets are seeking to intimidate our nation by over-counting the number of our martyrs. Those who think they can overawe our people are delusional. We’ve been fighting for seven years now and our environment has not shown any weariness but rather further embracement and support. 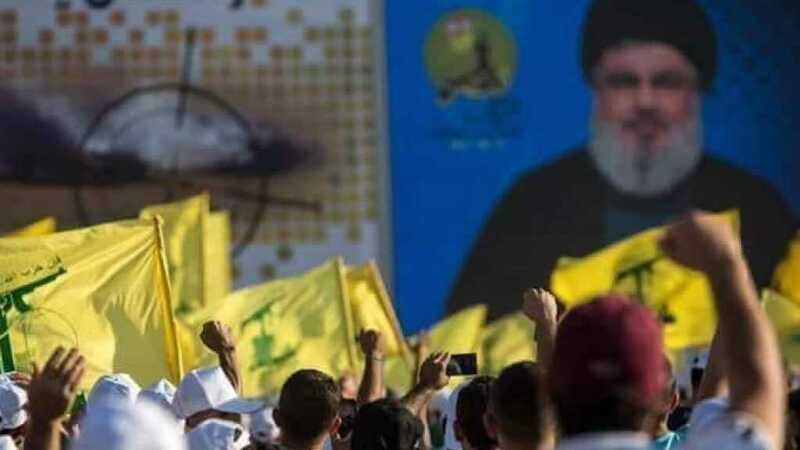 There is no place in Lebanon for an occupier nor a future for those who have expansion ambitions as long as our people cling to freedom, liberation, sovereignty and dignity,” Hezbollah leader said in the ceremony called “Glory & Victory”, held in Hermel, Northern Al-Bekaa. 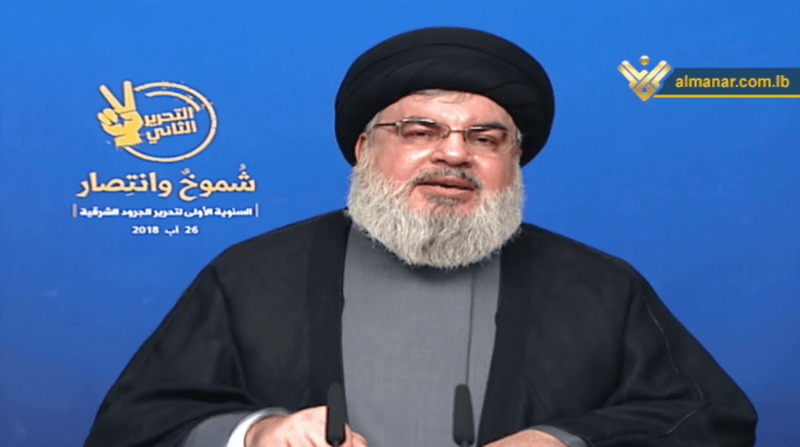 نصرالله للمراهنين على قرار المحكمة الدولية: لا تلعبوا بالنار..
Hezbollah Secretary General His Eminence Sayyed Hassan Nasrallah delivered on Sunday a speech in which he tackled various Lebanese and regional topics. Addressing tens of thousands in Hermel at the “Glory and Victory” festival commemorating the 2nd Liberation’s anniversary, Sayyed Nasrallah welcomed and saluted the huge crowd. “Some who had bet on Daesh and al-Nusra are classified as disbelievers by these groups that allow the shedding of their blood,” Sayyed Nasrallah cautioned. “If we want today to take the decision to participate in any operation in Syria, we will find that our youth need only a signal,” he elaborated. However, he praised the fact, “Fighting for seven years in Syria, we- in Hezbollah- have been fighting and no expression of boredom has come from our environment. He further revealed that the current data indicates that there exist new preparations for a chemical play in Idilb. To those betting on the STL, Sayyed Nasrallah sent a sounding message of three words: ‘Do not play with fire’. صعود المقاومة.. من مرحلة تحرير لبنان على الرغم من انهيار النظام العربي العام، وإلى مشروع إقليمي يجابه الأميركيين والإسرائيليين وبعض العرب المستثمرين في الإرهاب.. يُشكل استجابة منطقية للتصدي لتوسّع التدخل العسكري الأميركي في عالم عربي مكشوف. الدليل موجود في الاحتلال الأميركي العسكري لأفغانستان والعراق واليمن وسورية وليبيا والسودان والصومال وغيرهم.. وسابقاً لبنان الذي احتله تحالف غربي بقيادة «المارينز» في ثمانينيات القرن الماضي.. وحرّرته المقاومة بطرد المحتلين، الغربيين والإسرائيليين لاحقاً. أولاً في دحر الإرهاب من 80 من سورية ومنعه من تقسيم العراق والحيلولة دون استيلائه على اليمن والإمساك بقسم وازن من القرار السياسي في لبنان. ولمنع الأميركيين من التفكير بحرب عسكرية إقليمية جديدة، أطلقت المقاومة رسائل شديدة اللهجة والصدقية تعكس مستواها القتالي والجماهيري. فيما ردت واشنطن برسائل مضحكة وردّت على ألسنة قائد القوات اللبنانية سمير جعجع ومستشار الرئيس الأميركي بولتون ومسؤول الدفاع الأميركي الجنرال روبرت كاريم، ورئيس الحكومة سعد الحريري. البداية في إلحاق هزيمة بأكبر هجوم عسكري للتحالف العربي ـ الأميركي على الساحل الغربي لليمن.. تلاه هجومان على بارجة عسكرية سعودية وأخرى تغطية عند باب المندب. استكمالاً، ووسط أعنف تهديدات أميركية، لإيران.. نفذت طهران أكبر مناورات برية ـ بحرية في منطقة مضيق هرمز وسط صمت أميركي ـ سعودي ـ إسرائيلي كامل. بدوره عرض حزب الله صواريخ، أطلق نماذج منها على مدن محتلة في فلسطين في العام 2006، وهي رسالة صارخة تقول بلغة الإشارات، إنّ بحوزة المقاومة صواريخ أكثر دقة وذات تأثير أكبر وبأعداد هائلة. أما المقاتلة «الكوثر» الإيرانية التي كشفت عنها طهران فيكفي إقرار «الروس» بأنها طائرة نوعية ومقاتلة حديثة من إنتاج «إيراني كامل».. وهذا يدلّ على وجود أعداد منها لا تُحصى وتنتظر أي هجوم خارجي. أما لجهة إقرار «إسرائيل» بقوة حزب الله، وبالتالي إيران فيعتبر تسليماً بعجزها عن شن حرب بمفردها على لبنان أو إيران أو سورية.. فقد تحتاج إلى إسناد أميركي ـ غربي ـ مباشر.. باعتبار أنّ أي إسناد سعودي أو اماراتي لا قيمة له إلا بالدعم المالي فقط، والذي تلتزم به أبو ظبي والرياض بشكل دائم ومن دون أي ضغوط عليهما. لكن الترجمة السياسية لهذا التفوق تبدو واضحة في صور أخرى.. بدأت بزعم بولتون بأن روسيا وعدت الأميركيين بسحب الإيرانيين من سورية. معاوداً بعد يومين فقط التصحيح بأن موسكو قالت له بأن سحب الإيرانيين من سورية عملٌ ممكن.. وبدلاً من الاستمرار في إيقاع الفتنة بين روسيا وإيران في سورية، التزم البيت الأبيض صمت العاجزين محاولاً إحياء المفاوضات مع الرئيس الروسي بوتين. إلا أنّ الضربة القاصمة سدّدها النائب نواف الموسوي القيادي في حزب الله الذي كشف «ببراءة» عن عرض سعودي للرئيس الأسد ببقائه رئيساً دائماً لسورية مع إعادة إعمارها بشكل كامل اقتصادياً وسياسياً من قبل المحور الأميركي ـ السعودي. وهذا مقابل قطع علاقات دمشق بمحور المقاومة انطلاقاً من قطع العلاقات مع طهران. وهذا عرض خبيث، يريد تنفيذ أهداف الحصار الأميركي المضروب على إيران، وإنهاء المقاومات عند حزب الله والحشد الشعبي في العراق وأنصار الله اليمني، مضحياً بالمعارضات الوهمية التي يؤيدها على مستوى المنطقة. وكعادته، كان الرئيس بشار الأسد وطنياً وامتداداً لعصر أبيه الرئيس المرحوم حافظ الأسد، فرفض العرض متمسكاً بحلف سورية الأبية مع حلف المقاومة. فالشام صاحبة الريادة في مقاومة المستعمرين وأذنابهم. لقد قدمت الهند مشهداً صغيراً عن تأثرها بالحلف السوري، مع المقاومة، ورفضت مساعدات بمئة مليون دولار هبة من دولة الإمارات لمنطقة هندية، أصابتها سيول وفيضانات قتلت مئات الأفراد وشرّدت الملايين. وجاء الرفض على خلفية التخوف الهندي من انتشار الفكر الإرهابي مع المساعدات الإماراتية على جاري العادة الخليجية بالربط بين نشر الوهابية والمساعدات، مع الإشارة إلى أنّ غالبية السكان في المناطق المتضررة مسلمون. إنّ سورية التي تقاوم هجوماً استعمارياً دولياً وإرهاباً غير مسبوق في التاريخ، نجحت في تصنيع راجمة شديدة التطوّر للقذائف الصاروخية بإمكاناتها الداخلية الصرفة.. وبإقرار روسي وصمت غربي يتعجب كيف لهذه الدولة أنّ تستمر بعد معاناة سبع سنوات، في إنتاج الكهرباء والماء والأمن الداخلي ومقاتلة الإرهاب وأجور الموظفين والعناية بالقوى الأمنية ورعاية الانتظام العام وسحب النفايات. أما الأميركيون المذهولون من نجاة الدولة السورية بقوة إمكاناتها، فأطلقوا على لسان حليفهم قائد القوات اللبنانية سمير جعجع نظريات أوهى من خيط العنكبوت وقوس قزح.. وذلك بزعمه و»بكل براءة» أنّ الأميركيين وحلفاءهم عازمون على سحب الإيرانيين من سورية و»لبنان»! مضيفاً بأن «الرئيس الأسد راحل معهم بكل تأكيد».. فلا يبقى إلا جعجع وريث الخط المتحالف مع الاستعمار الفرنسي والأميركي وصولاً إلى حلفه مع الإسرائيليين الذين احتلوا لبنان بالتعاون مع «قواته» من الثمانينيات وحتى العام 2000. بدا جعجع في مقابلته التلفزيونية أداة إعلامية تحاول بث التفاؤل في مشروع مهزوم ومصاب بشكل كامل.. لذلك ظهر كمهرّج يعتمد على الأحلام في عالم التوازنات والواقعية، واضعاً كل آماله في عباءة الحلف الأميركي ـ السعودي ـ الإسرائيلي، أما «قواته» فهي للزوم بعض العمليات الداخلية فقط، ولا يريد إلا بضع وزارات تؤكد تموضعه في الساحة المسيحية وحصتها في القرار السياسي اللبناني. لجهة رئيس الحكومة المكلف سعد الحريري فيشكل رسائل أميركية ـ سعودية لعرقلة أي حكومة جديدة في لبنان، تستند إلى نتائج الانتخابات الأخيرة. لذلك يعتمد «السعد» على أدائه ضد سورية بتفجير مسجد السلام في طرابلس لمنع التطبيع الكامل للعلاقات السياسية والاقتصادية معها، كما يستند على نتائج المحكمة الدولية لتقليص دور حزب الله في السياسة اللبنانية. لذلك يقدّم الشيخ سعد كل ما تريده الرياض، والمطلوب فقط أنّ «ترضى» عنه ليستمر في دوريه المتكاملين، زعيماً للسّنة وبالتالي رئيساً دائماً للوزراء، وموافقة ولي العهد محمد بن سلمان على إعادة تنشيط الدور الاقتصادي لعائلة «السعد» في السعودية. وبذلك تدوم «النعم».. والجمع بين الدين.. والدنيا. أما الإشارة الأميركية الجديدة لعرقلة انتصار المقاومة في الإقليم، فتجسّدت في زيارة قام بها مستشار الدفاع الأميركي الجنرال روبرت كاريم على رأس وفد إلى لبنان، مقدّماً عرضاً لتسليح الجيش اللبناني وحمايته مقابل نشر اليونيفيل عند حدود لبنان الشرقية مع سورية. وبذلك تصبح الحدود الجنوبية مع فلسطين المحتلة متساوية بالحالة العدائية مع حدود لبنان مع دمشق قلب العروبة. بالطبع فإن الرئيس العماد ميشال عون، لم يقبل. لكنه أطلق تعبيراً «التفافياً» وذكياً، بقوله إنّ مثل هذه الأمور تحتاج إلى حكومة هي غير موجودة حالياً، ويعلم رئيس البلاد، أنّ قرارات على مستوى توسعة مدى حركة اليونيفيل تحتاج إلى «إجماع وطني» يستحيل توفره أو إقراره. فتبدو إجابات الرئيس استدراجاً لمعرقلي تشكيل الحكومة، للعودة عن العُقد التي يطلقونها بين الحين والآخر، لتعطيل تأليف حكومة جديدة. هذا ما يكشف الفارق الكبير بين رسائل حازمة وصادقة نفّذت محتواها جبهة المقاومة في كل الميادين، مقابل رسائل من الحلف الأميركي، «تبيعُ» أحلافاً وهمية وزائفة ليست لها مرتكزات على الأرض. وهكذا يواصل حلف الحريري ـ جعجع الاعتماد على اندلاع حروب أميركية كبرى في الإقليم من أجل كسب رضى السعودية وسعدها وجعجع!! «الانغماسي» يُعيد شبح التفجيرات والضغط على حزب الله..
ادلب:الجيش السوري بات جاهزا لساعة الصفر..